where VB is the rotational velocity at the Earth's surface, h is in kilometres, and AE is the energy increase required in Joules per kilogram. Appendix M tabulates the period, velocity, energy required, and size of the Earth's disk as a function of altitude for Earth-orbiting satellites. 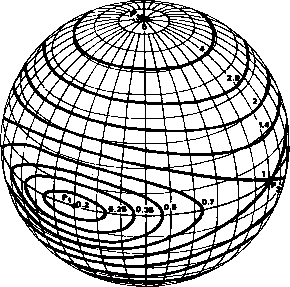 Thus far, we have been concerned with two-body Keplerian orbits^ However, there is a simple class of three-body orbits, known as Lagrange point orbits,* which is of particular interest to spaceflight. As shown in Fig. 3-13, the Lagrange points, or libration points, for two celestial bodies in mutual revolution, such as the Earth and the Moon, are the five points such that an object placed at one of them will remain there. The three Lagrange points on the Earth-Moon line are positions of unstable equilibrium; i.e., any small change causes the object to drift away. However, L4 and L}, which form equilateral triangles with the Earth and the Moon in the plane of the Moon's orbit, are positions of stable equilibrium. A satellite placed near the Lagrange point (with an appropriate velocity) remains in essentially the same position relative to the Earth and the Moon. Because of the stability of Lagrange point orbits about L4 and Ls, they have been proposed as one possible location for permanent colonies in space [O'Neill, 1975]. As a natural example of this phenomenon, the Trojan asteroids are a group of 14 known asteroids which have collected at the stable Lagrange points of the Jupiter-Sun system.